Since becoming a Muma and giving birth (yes, I will use that phrase, no, they didn’t come out of my hooha) to our two scrumptious Hells Angels I have come to realise there is distinct snobbery when it comes to the wonderful world of BIRTHING. “Oh there was no time for gas ‘n air, just gentle chanting with a dash of hypnosis.” Good for you honey, but please turn off ‘pity eyes’ when I relay my C-section tale in return. 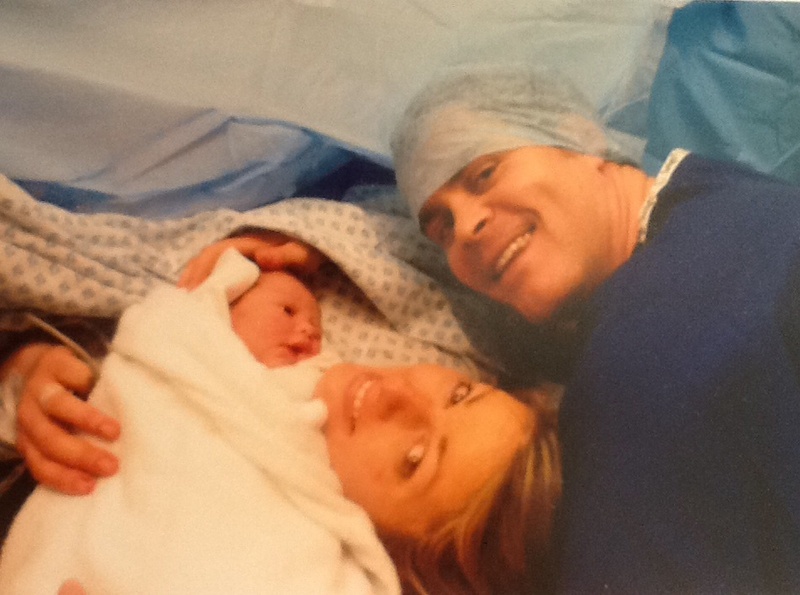 Here’s the thing: I LOVED my Caesarean Section. Yes, you read that correctly. Our first was a stubborn breach baby who chose to arrive earlier than my planned Section, leading to a swift trip straight to theatre. I’m not going to lie, I was bricking it. I had never had an operation before or been admitted to hospital, I had no idea what to expect. I had endured long nights of NCT classes learning all about breathing and the various stages of labour. But that was all irrelevant now, my unborn baby and I were solely in the hands of a group of strangers – all holding rather sharp implements! That said, the spinal block has kicked in with almost immediate effect, the pain of the contractions had stopped and I was enjoying a strange state of calm. Hubster has a strong stomach and watched the entire process, my body being cut in two and clamped open while they rummaged around to pull Darcie into the world. The stress my body was undergoing was massive, but I was not in pain. I was listening with every fibre of my being for that first cry; for me that was my first ‘meeting’ of Darcie. I didn’t see her all blue and fresh out of the drawer, it was all too quick,and they wanted to check her over. After an eternity we heard a noise I was going to become very familiar with over the next few months, a cry, from a baby: my actual baby! The reality of having a baby had finally dawned on me, (thank god) this was real, and it felt great. To add to this kind of idyllic setting, the radio was playing none other than ‘Your Beautiful’. Good old Blunt had come up trumps, you couldn’t have wished for a cheesier moment! Major surgery teamed with a new baby was a little tricky – for darling Hubster. For me, it meant sitting on the sofa feeding our baby while he ran around for the first couple of weeks making dinner, bringing me coffee, entertaining the endless line of baby watchers, sorting through mountains of baby washing, basically being a human Jack in a Box. What’s not to love about seeing your husband take up the slack after your nine months hard work? A couple of years later, we were DING DING round two and I was all about the elective C-Section. So off I trotted to the hospital to meet with a midwife around week 25 to ‘discuss options’. This is when I realised that birthing snobbery was far from being exclusive to baby groups: this midwife could run the movement. I understand and fully appreciate that medical staff have to present you with the facts. I just wonder how much the figures and cost of elective C-sections over hooha births really effect their advice and stance. Count Midwife’s opener was along the lines of: “You do realise by choosing a C-section you are increasing the risk of foetal death and death to the mother?” Super. Just what I wanted to hear. The tears flowed while I was brainwashed into agreeing to attend a V-BAC class with several of her other victims. Why was I being made to feel guilty for wanting to re-enact the same magical experience I had loved the first time round? What happened to a mother’s choice? I hear the haters out there: “Magical?? Pa!” But yes, it was magical. If magic isn’t a new life being pulled from a water-logged hole INSIDE of you, whilst you are awake with darling Hubster getting a full frontal of your innards, then I don’t know what is. Finally the pressure from the midwives got to me, “You can do this! Give it a go!” Like they were encouraging me to try the new Big Dipper in Blackpool. So I did. It didn’t work. After four hours of labour not progressing as they had hoped I was wheeled into the familiar setting. Once again the contractions disappeared and I braced my body to take on its next challenge. Baby Lila arrived and our world shifted a little more to the right once again. It was cheesy, and beautiful. This time I saw her as a freshy: all blue and icky. A piece of the puzzle I was glad to finally have. Recovery second time around was not quite as luxurious as the first – my butler now had his hands full with a nearly three year old. However, the scar healed faster, and I felt stronger much quicker; possibly this was through necessity rather than nature knitting it all back together in record time! I guess all I’m trying to say is, pipe down C-section haters – I earned my stripes just as well as you did. And to those who are dreading their ideal birthing plans ending in a C-section, please try not to. The fear is far worse than the reality. Previous postRose Tinting the Toddler Years: Make ToddlerMonsterItis work for YOU. C-sections are just as beautiful as a natural birth: I’m sure of it! !